Robert Edwin Dunville (1906-1963): President of Crosley Broadcasting Co.
President of Crosley Broadcasting Co.
DUNVILLE, Robert Edwin, broadcasting executive, was born in St. Louis, Mo., Nov. 24, 1906, son of George Robert and Minnie LaFore (Stringfellar) Dunville and grandson of Thomas and Sarah Elizabeth (Tongue) Dunville. His father was for many years general sales manager in St. Louis for the Dodge Motor Co. Robert E. Dunville received his preliminary education at public schools in his native city; was graduated A.B. at the University of Missouri in 1926, and pursued graduate courses at that institution during 1926-28. In the latter year he began his active business career as advertising manager of the Gardner Motor Car Co., St. Louis, a position from which he resigned in 1931 to become assistant general manager of Radio Station KMOX, St. Louis, of which James D. Shouse was then general manager. When, in 1937, Shouse accepted an invitation to become general manager of the Crosley Radio Corp., owners and operators of radio stations WLW and WSAI in Cincinnati, Ohio, he persuaded Dunville to accompany him and to serve as assistant general manager of WLW and manager of WSAL. In 1938 Dunville was named general manager of both stations, and after the operating company was reorganized as the Crosley Corporation later in the same year and each of the radio stations acquired separate staffs, Dunville was made commercial manager of WLW. In 1944 he was elected vice-president of the Crosley Corporation and became general manager of WLW, and in 1945, after the Crosley manufacturing and broadcasting activities became separate entities, he assumed those posts with the newly organized Crosley Broadcasting Co. 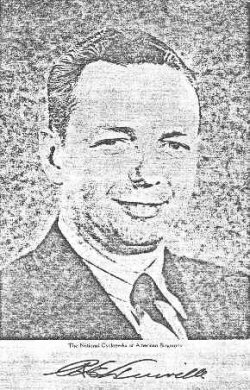 He succeeded to the office of president in 1949, when Shouse was elevated to chairman of the board of Crosley Broadcasting, and Dunville continued as active head of the company until the close of his life. Under the joint leadership or Shouse and Dunville over a period of twenty-five years, WLW was piloted through a time when radio achieved its peak popularity as well as through the doldrums that beset all radio broadcasting following the advent of television; through the pioneer development of television broadcasting and on to the successful operation of a TV network of five stations; and, finally, through the re-establishment of radio as a powerful communications medium, functioning anew as a source of information rather than of entertainment. Among the notable events and accomplishments of the Crosley enterprises in the years from 1937 to 1963 were: the purchase in 1941 of a farm in Mason, Ohio, which became known as Everybody's Farm and from which farm programs were broadcast; the construction in 1942 of six transmitters in Bethany, Ohio, from which Voice of America programs emanated until 1963; the inception in 1948 of WLW-T, the first television broadcasting station in Ohio and one of the first in the country, and the second station to become an NBC-TV Network affiliate; the inauguration in 1953 of WLW-T as the first color affiliate in the NBC Network; the renting in 1954 of Crosley broadcasting facilities at $1 a year to WCET, the first licensed educational television station in the United States, this procedure constituting a notable public service; the installation in 1955 of the first radar weather service, a service later extended to cover a 300-mile area through the combined radio and television facilities of WLW; the installation in 1959 of the newly developed Crosley system of AM transmission, making WLW the highest fidelity radio station in the world; adaptation in 1959 of a new low-light tube developed jointly by the Crosley and General Electric companies, making possible the first colorcasting of indoor remotes; the first colorcasting, also in 1959, of big league baseball on a local and regional network; the first colorcasting in 1960 of nighttime baseball and other nighttime outdoor remotes; and the renting in 1960 of Crosley FM transmitting facilities at $1 a year to the University of Cincinnati for educational broadcasts. During these years Crosley Broadcasting received numerous major awards in the fields of programming, merchandising, and public service and community participation broadcasting, and in 1961 it was the first recipient of the Silver Mike Award presented by the U.S. Radio magazine. Dunville contributed articles to various periodicals, the most noteworthy of which were: "Colortown U.S.A." (Radio-Television Daily, Sept. 9, 1960), "Color In Cincinnati" (ibid., Sept. 11, 1961), and "Radio's Image" (U.S. Radio, Jan. 1962). An active participant in civic affairs, he was a member of the Naval Advisory Board and the Educational Television Commission in Ohio, a trustee of the Greater Cincinnati Television Educational Foundation and the Memorial Heart Laboratory and Clinic in Cincinnati, and a director of the University of Cincinnati College of Pharmacy. He was also a founding member of the Naval Broadcasting and Telecasting Advisory Board, which was organized in 1957 to study the use of communications media in recruiting programs for the U.S. Navy. He held membership in Radio Advertising Bureau, Inc., the Television Bureau of Advertising, Sigma Chi, Newcomen Society in North America, the Masonic order, Confrerie des Chevaliers du Tastevin of New York City, and the Ohio River Launch, Great Lakes Cruising, Bankers, Cincinnati, Cuvier Press, Propeller, Variety, and Maketewah Country clubs, all in Cincinnati. In religion he was a Presbyterian. Politically he was a Republican. His special interests included metal and woodworking, boating and flying, and he was a qualified civilian pilot. He was married in St. Louis, Mo., Aug. 9, 1933, to Edna Roberta, daughter of Otto Buder of that city, an engineer, and had two children: Robert Edwin and Roberta Edna, who married William Franklin Sprague. Robert E. Dunville died in Cincinnati, Ohio, Feb. 28, 1963.